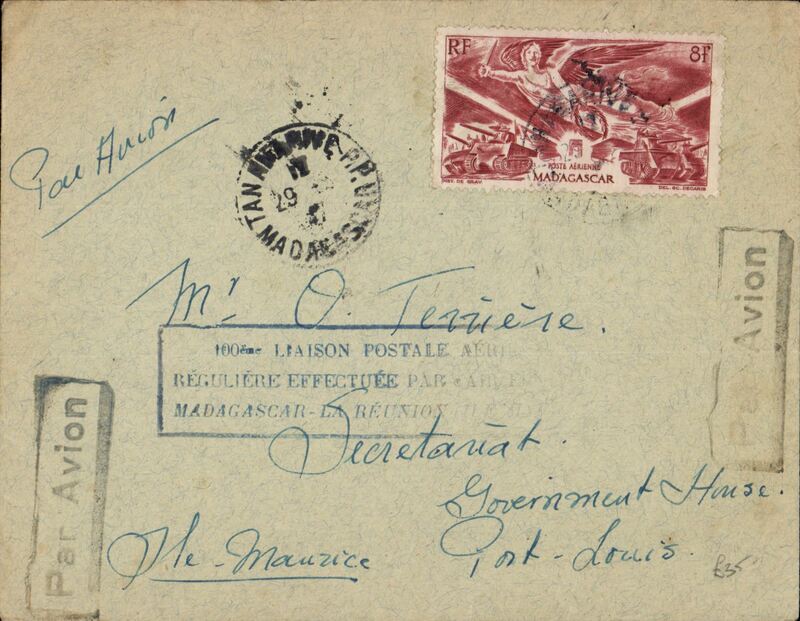 Tananarive to Australia, bs Perth 4/1/35, via Darwin 1/1/35, first acceptance of Madagascar 'all the way' airmail for Australia for carriage on the Imperial Airways African service to Cairo, 14/12 transit cds, intended to connect with the first extension of the IA/ITCA/Qantas service from Singapore to Brisbane, official 'Kangaroo' cover franked 1/8d canc Grahamstown cds. The Cairo 14/12 transit confirms this cover was in the first Africa-Australia dispatch. 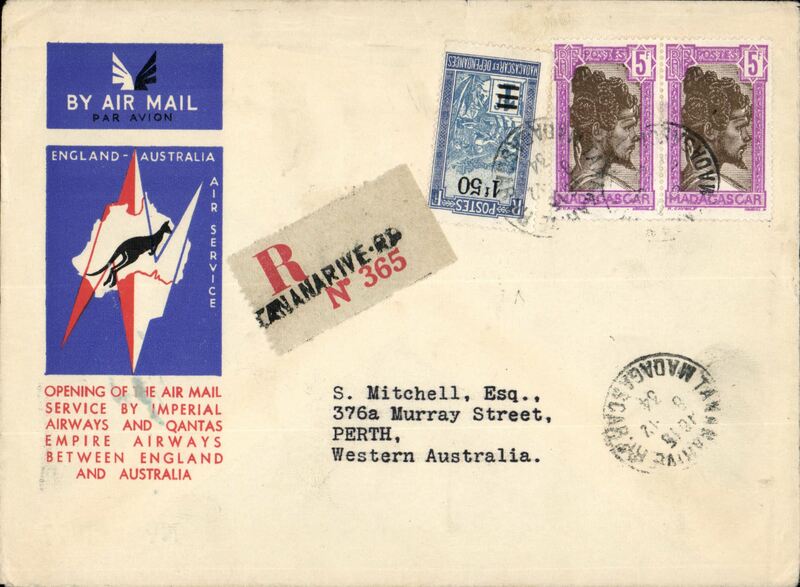 The 1/1/35 Darwin arrival confirms a delay at Cairo due to the large quantity of mail dispatched from from GB, causing IAW to run a duplicate service as leat as far as Singapore. See Wingent p132. 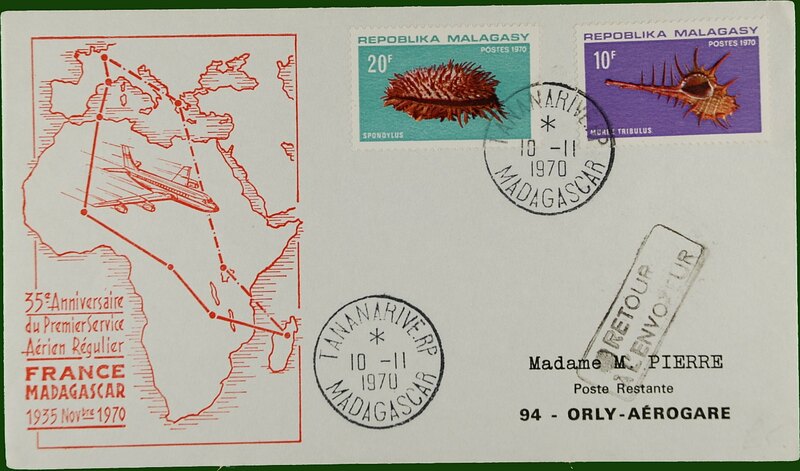 A rare item and a nice one for the exhibit..
Internal airmail, Diego Suarez to Tananarive, bs 7/7, imprint etiquette cover franked 50c, canc Diego Suarez cds, red circular 'Aero-Club de Madagascar/Tananarive' cachet, fine strike three line "Diego Suarez-Tananarive/Achemine Exceptionel/Par Avion" - a handstamp for internal carriage by military planes without air fee. Therefore corectly rated 50c for 20g by surface. Nice item. 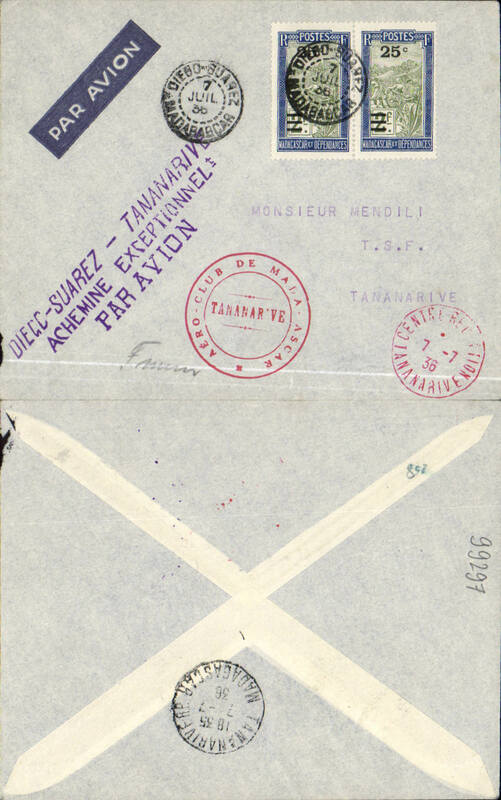 Assolant survey flight, Tananarive to Fianarantsoa, bs 1/11, flight cachet, franked 50c. 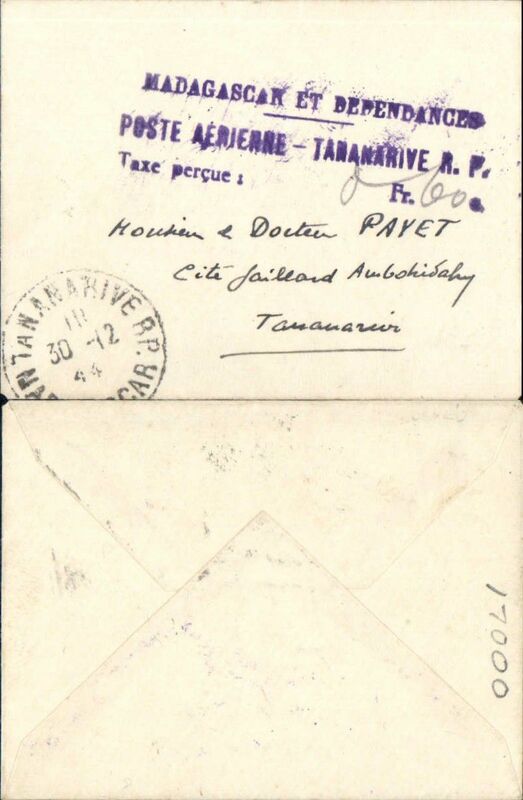 Small cover, 7x8 cm, adressed to Tananarive, posted on arrival, canc 'Tananarive R.P./30 -12 44/Madagascar', uncommon violet three line "Madagascar et Dependances/Poste Aerienne - Tananarive R.F./Tax percue: Fr (ms 60) c" hs.Unusual. 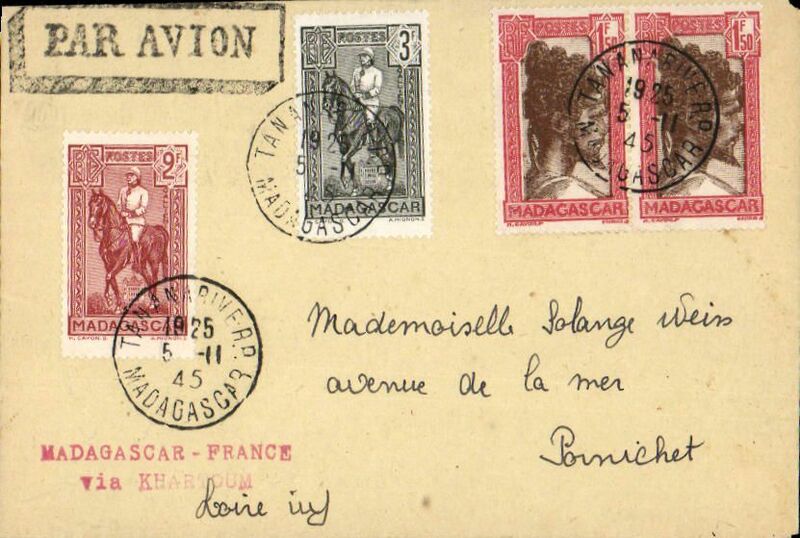 Air France, early post WWII F/F, Tananarive to Pornichet, France, bs 13/11, via Khartoum, plain cover correctly franked 2F domestic letter rate + 6F air fee, canc Tananarive cds, red two line "Madagascar-France/via Khartoum" instructional hs, black framed 'Par Avion' hs. 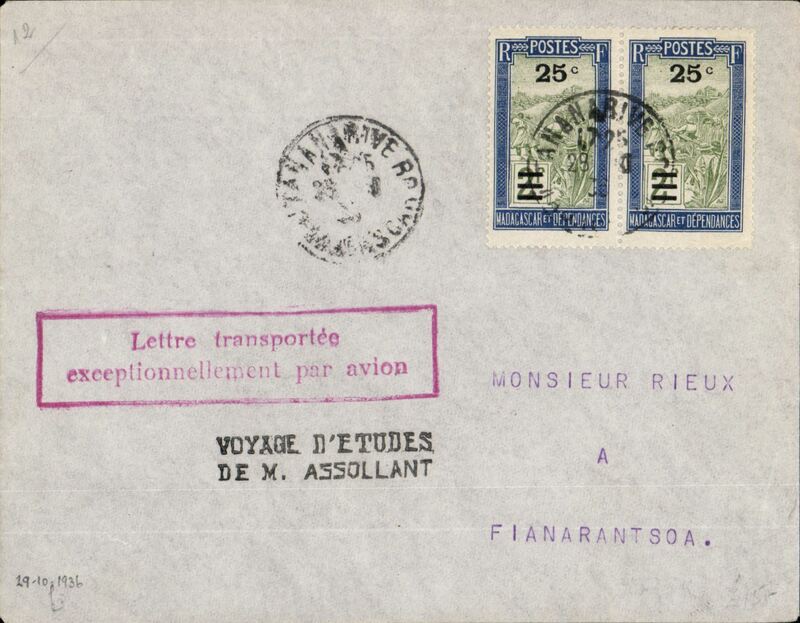 Tananarive to Reunion, bs Port Louis 31/3, commemorating 100th flight, plain cover franked 8F, black framed 'Par Avion' hs. 35 anniversary, Tananarive to Paris, b/s, cachet, Air France.